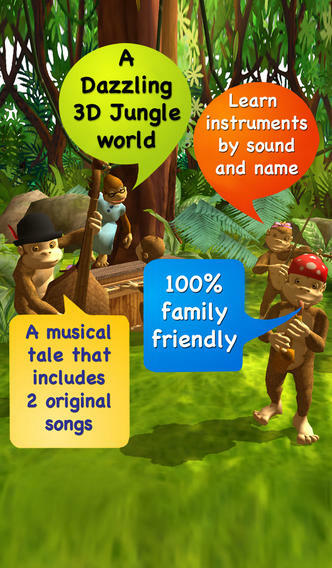 Gorilla Band 3D is a charming iPhone app for kids. 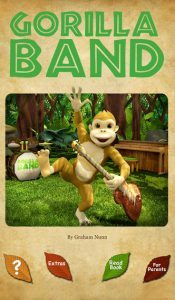 Part storybook and part musical event, Gorilla Band was created by Wasabi Productions. 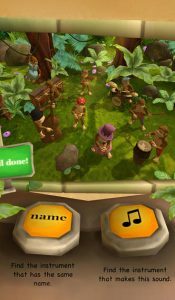 Gorilla Band 3D is a sort of spiritual successor to Ten Giggly Gorillas, which was “1 of just 5 finalists in the kids app category at the Publishing Innovation Awards in 2013,” according to the App Store. 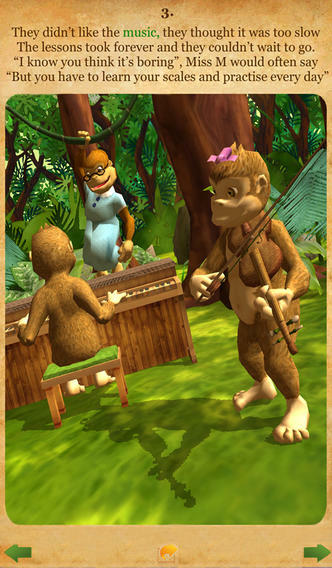 In Gorilla Band 3D, you can watch as a group of animated gorillas forms a band and makes music together. The story plays out through both text and animations. You can choose the “read to me” option, or users can read to themselves. The animations are highly interactive, more so than similar apps in this category that I’ve had the pleasure of reviewing. What’s more, there are multiple levels of interactivity. For example, if you tap a character once, they will say something. Tap them twice, and they’ll say a different phrase or play a different musical tune. If you’re enjoying the story on your iPhone, you might want to select the “Read to me” option. The text is very small on the iPhone, though it does light up as each word is read aloud. I’m really impressed with the quality of the 3D animation, as well as the quality of the voiceover work. The narrator and character voices are well done, and the whole experience is quite engaging. In addition to the storybook element, there is a mini game where you child can learn to match the sound and name of an instrument to its appearance. For just 99 cents (a special launch price for the app), Gorilla Band 3D is quite a steal. 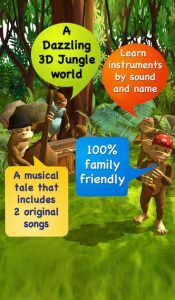 If you have young children who really love animals or music, this app will amuse and entertain them to no end. Gorilla Band 3Dis compatible with iPhone 3GS, iPhone 4, iPhone 4S, iPhone 5, iPod touch (3rd generation), iPod touch (4th generation), iPod touch (5th generation) and iPad. Requires iOS 4.0 or later. This app is optimized for iPhone 5.